Tarnished Earth, a dramatic open air gallery of photographs by Jiri Rezac, telling the story of one of the world's biggest ecological disasters, arrives in Brighton next week (Wednesday, 11 May). 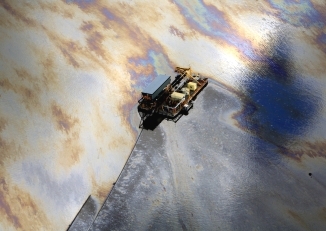 The free outdoor exhibition, which shows how Canada's magnificent Boreal Forest is being destroyed and polluted by the rush to extract oil from the tar sands just below the surface, will be on Brighton seafront, until 6 June. Tarnished Earth, which is being staged by The Co-operative in conjunction with WWF-UK and Greenpeace, is touring the UK and has so far been seen by more than a million people - the Brighton exhibition is the only time the striking images will be on display on the South coast. The photographs, which are illuminated at night, contrast the destruction caused by the oil extraction with the area's pristine wilderness and the traditional way of life of the indigenous First Nation Cree. Graham Hammond, The Co-operative Group's South East Regional Secretary, said: "It is really important that people see for themselves the scale of the environmental destruction which is being done in order to extract oil from tar sands. "The greenhouse gas emissions from tar sands oil are far greater than those of conventional oil, and its exploitation alone would be sufficient to take the world to the brink of runaway climate change. "Tarnished Earth vividly portrays the impact tar sands operations are having on this beautiful area of boreal forest which has been home to wildlife and the indigenous Cree nations for thousands of years." The Co-operative is also bringing its fight against Tar Sands to the big-screen in Brighton. The screening of The Co-operative's docu-film, Dirty Oil, is to take place at the Odeon (Brighton, Kingswest) on 19 May – the movie explores the struggle between industry, government, local communities and environmentalists over the Canadian tar sands. Graham Hammond added: "The film highlights the damage that energy companies are causing in Canada, the impact this has for every single person across the world, and what we can do to help stop it." Dirty Oil, starts at 7:00pm with registration at 6:30pm and, there is also an opportunity to meet The Co-operative membership team at the Tarnished Earth exhibition from 4:00pm. In addition, on Sunday 5 June, World Environment Day – a day aimed at being the biggest and most widely celebrated global day for positive environmental action – The Co-operative Membership team will be available at the Tarnished Earth exhibition from 10am until 4pm to provide guided tours and further information about the striking images.